School Implementing Inclusive Education or Sekolah Penyelenggara Pendidikan Inklusi (SPPI) is a school that uses educational service system which allows children with special needs to participate and study together in regular classes along with their normal peer. Status alteration from regular school to SPPI has been causing new problems in its implementation and it may also cause negative emotion among the teachers. Negative emotion emerges due to the teacher’s failure to deal with existing problems and perceiving the event as threatening. The negative emotion comes in the form of experiencing unpleasant feelings such as worry, tense, irritable, and depressed due to the workload they carry as teachers. Teachers may have both positive and negative emotions. Positive emotion is a pleasant emotion and it has positive effects towards teachers of SD PPI. The approach that may improve positive emotion and reduce negative emotion is mindfulness. Participants were teachers of SPPI which were assigned into two groups, experiment and control (waiting list). The design of this study used was quasi experiment using untreated control group design with pre-test and post-test design with two measurements: before and after treatment. 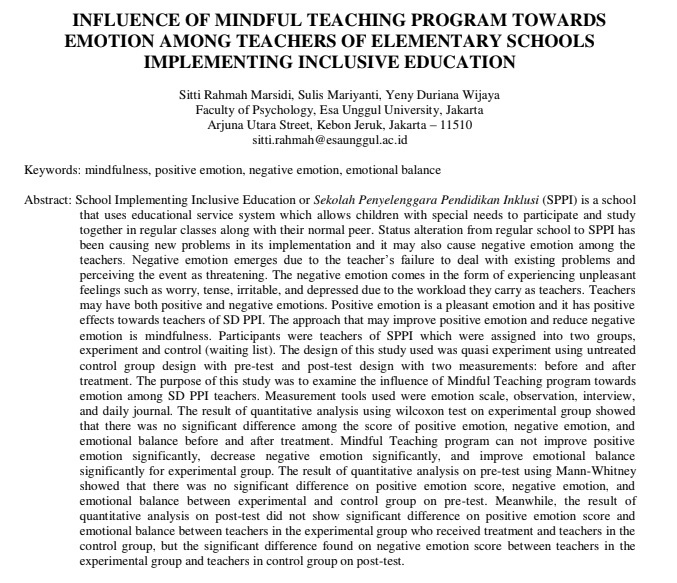 The purpose of this study was to examine the influence of Mindful Teaching program towards emotion among SD PPI teachers. Measurement tools used were emotion scale, observation, interview, and daily journal. The result of quantitative analysis using wilcoxon test on experimental group showed that there was no significant difference among the score of positive emotion, negative emotion, and emotional balance before and after treatment. Mindful Teaching program can not improve positive emotion significantly, decrease negative emotion significantly, and improve emotional balance significantly for experimental group. The result of quantitative analysis on pre-test using Mann-Whitney showed that there was no significant difference on positive emotion score, negative emotion, and emotional balance between experimental and control group on pre-test. Meanwhile, the result of quantitative analysis on post-test did not show significant difference on positive emotion score and emotional balance between teachers in the experimental group who received treatment and teachers in the control group, but the significant difference found on negative emotion score between teachers in the experimental group and teachers in control group on post-test.